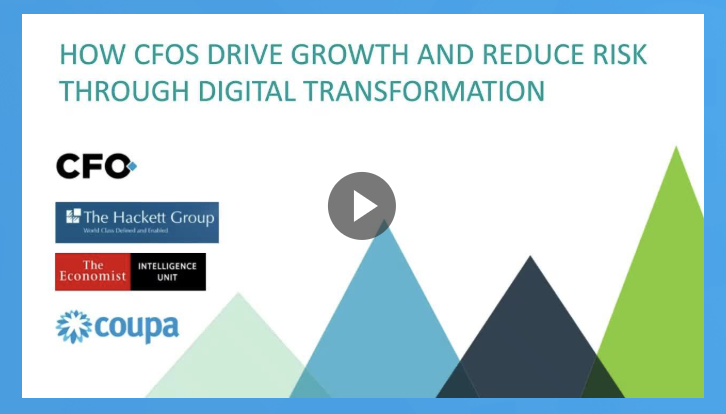 Learn how CFOs can apply the latest advances in digital transformation to recognize opportunities and anticipate risks sooner than their competitors. To a greater extent than ever, finance leaders are having to navigate among conflicting priorities as they seek opportunities to achieve growth relative to their competitors while mitigating risks and controlling costs. But by applying the latest advances in digital transformation, most notably in the areas of automation, cloud-based network architecture, and artificial intelligence, CFOs can align conflicting priorities by focusing on analysis rather than reporting. In so doing, CFOs not only gain visibility into their companies' current performance; they also enable their companies to recognize opportunities, as well as anticipate risks, sooner than their competitors. How finance leaders can recognize and overcome obstacles to fulfilling their organizations' overarching performance goals.